Paradise Pointe is a North Myrtle Beach resort that calls the Cherry Grove section of North Myrtle Beach, South Carolina home. This oceanfront North Myrtle Beach resort has an oceanfront pool deck with a variety of ways to recreate in the water and it also features a four-story parking garage for your convenience. Beautifully located in close proximity to shopping, dining, Myrtle Beach golf and live entertainment theatres, Paradise Pointe is truly a paradise for families seeking a beach vacation with accommodations that are rather spacious. The North Myrtle Beach rentals at Paradise Pointe are three- and four-bedroom units. Each of these North Myrtle Beach condominiums features an oceanfront balcony that is furnished so you can relax and just gaze at the Atlantic Ocean. These large North Myrtle Beach rentals can sleep between eight and 14 people, so they are ideal accommodations for larger families and golf foursomes. This oceanfront North Myrtle Beach resort is designed where the bottom four floors of this high-rise are the parking garage and the next nine floors are the North Myrtle Beach condominiums. Every North Myrtle Beach vacation rental at Paradise Pointe has views of the oceanfront pool deck. Take a seat on your private balcony at Paradise Pointe and marvel at the sparkling blue water of the swimming pool, kiddie pool and lazy river. What you cannot see from your oceanfront balcony perch is the indoor swimming pool at this North Myrtle Beach resort. There is an elevator and stairway at both ends of the single hallway that runs in front of all the North Myrtle Beach condominiums on each floor. There are only five North Myrtle Beach condos per floor, so this is a more intimate setting for you to enjoy. At Paradise Pointe you can find luxury North Myrtle Beach rentals, North Myrtle Beach condos with high-speed Internet access and traditional North Myrtle Beach vacation rentals that are completely affordable for those families on a budget. Take your pick because the selection at Paradise Pointe is quite varied. 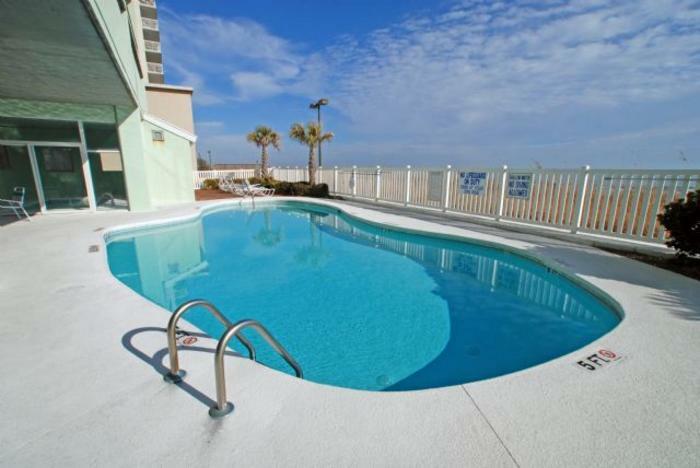 All of the North Myrtle Beach rentals at this North Myrtle Beach resort have three baths. So you decide if you want three private bedrooms or four private bedrooms for your North Myrtle Beach vacation. Furthermore, most of the North Myrtle Beach condos at Paradise Pointe have sleeping accommodations on a sleeper sofa. Elliott Beach Rentals is not affiliated with onsite management or the HOA of Paradise Pointe.